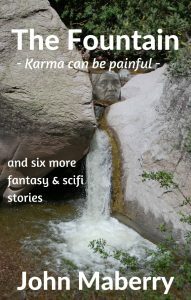 Karma can be painful in “The Fountain”–when a plunderer meets a long-dead shaman. What could that column of fire be, rising from the Atlantic off the Outer Banks, read “The Flame” to find out what it meant to troubled writer Carson. will it be as good for him? Finally, “The Fribble” offers an alien encounter of an odd sort, to a pharmaceutical company rep searching for new drugs in the Amazon Rain forest.